I was hoping to share an update on the tree work taking place in my garden today, however as it's still underway I've decided to leave that until next week. 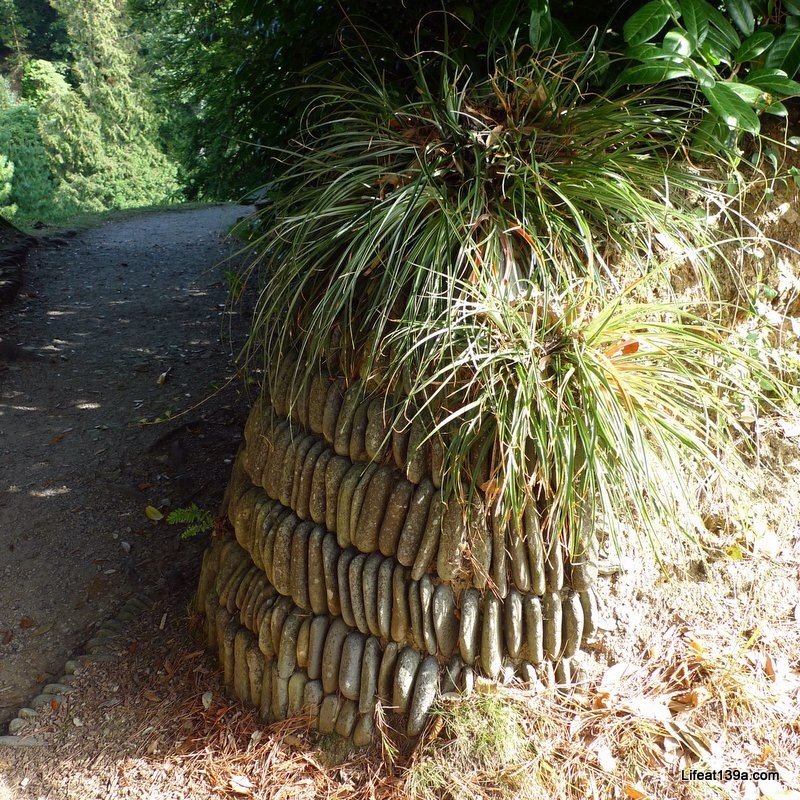 So instead there's pictures from our visit to Glendurgan Gardens in Cornwall, another from our trip in September. The gardens were started by the Fox family in the 1820s as they wanted a "small piece of heaven on earth". Two of the Fox brothers lived close by - so as our guide explained, they really did like the area - and one founded Trebah Gardens just up the road. I'll share my pictures from there another time. Glendurgan is a wild and wonderful valley garden and the climate and geography are key to its success. Wooded slopes provide shelter and being in one of the mildest climates in the UK also helps. 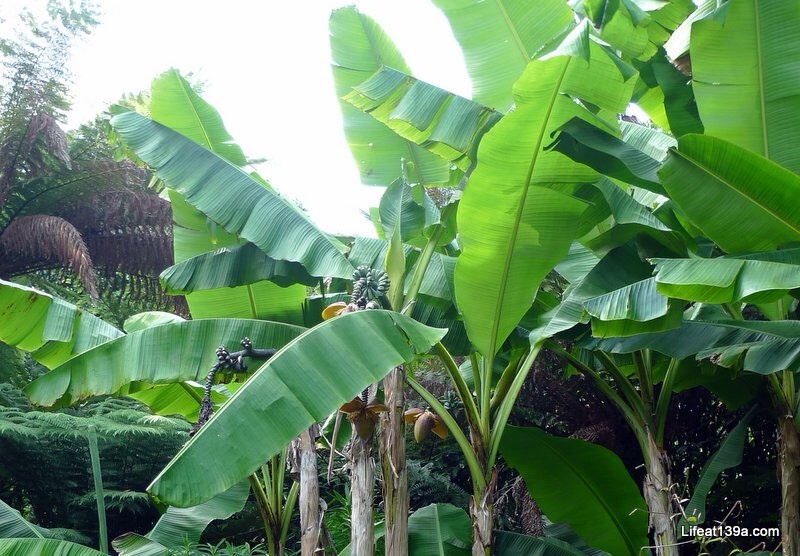 Like other Cornish valley gardens there's many sub-tropical plants and one or two other fascinating additions - remember this Boat Seat I shared a while back? We were given a handy tip to walk down one side of the garden as if we were to come up the other side it would be less steep. So duly noted and a few metres along we couldn't remember if we were supposed to walk down the left or right-hand side of the garden. Oh well, we decided to head towards the School Room and headed off down this pretty cobbled path. There were lots of cobbles in the garden and put to good use in paths and walls. I'm not sure I'd fancy either collecting them, hauling them up (or down) the valley or laying them! And so we reached the rebuilt School Room. It was rebuilt in 2002 and provides a focus at the head of the valley and is a modern interpretation of the original building. 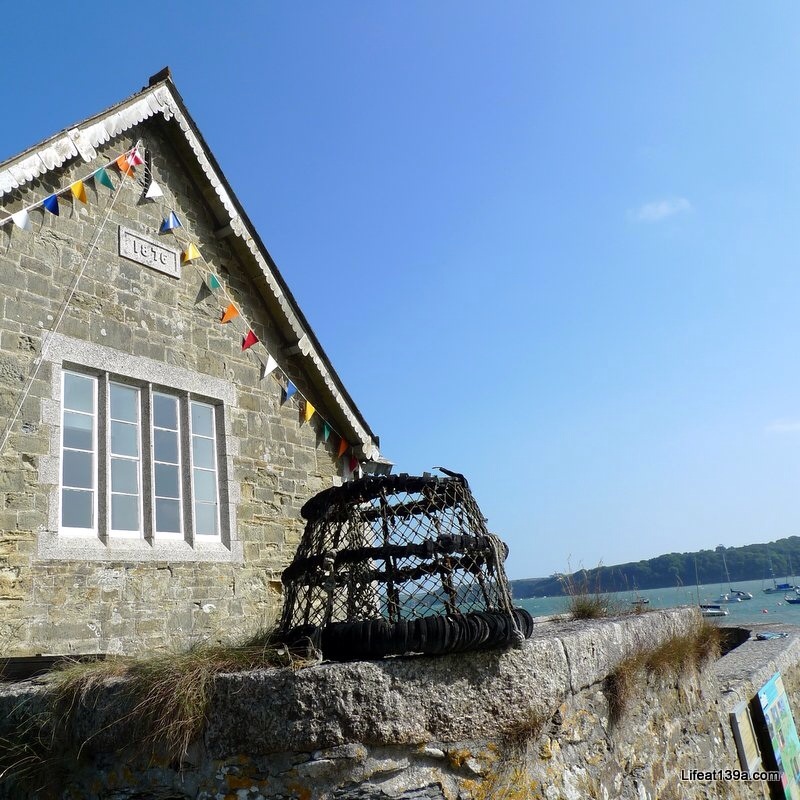 The original building was built in 1829 and was used by Mrs Fox to educate local children until 1842 when the school moved to the loft of a fish cellar in the village of Durgan at the bottom of the valley. With views out to this tree and down the valley, it's a pretty idyllic place to learn. Before heading down towards the village of Durgan and the coast, we headed over the Bamboo bridge. The handrails were made of bamboo and tied functionally and decoratively with rope. 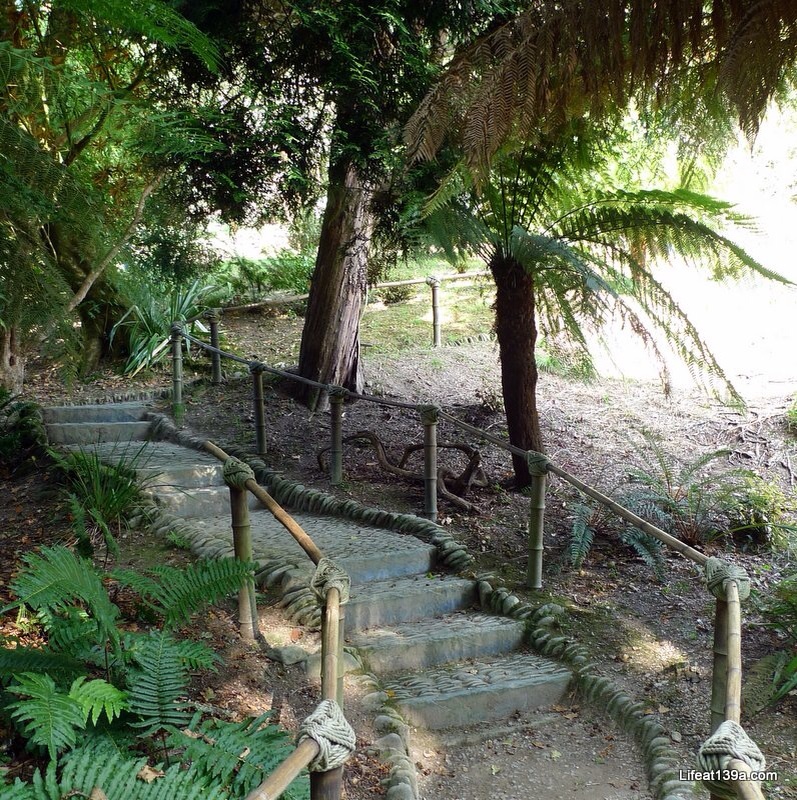 The paths were surrounded by lush greenery which brought some respite from the warm September Cornish sun. There were hints of autumn though with fungi appearing. And then we got our first glimpse of the view and the Helford river. Yes, wow! The village of Durgan was quaint and they must have known we were coming as they'd put the flags out... We sat on the beach wall watching the water (and other visitors) for a while before heading back up the valley using the path on the other side of the garden. This side was steeper so in our 50-50 choice earlier I think we switched the advice we were given, oh well. Onward and upwards. It wasn't long before we came across this old water pump in what was probably a practical place but it seemed a little odd to us. And then there was the Old Cattle Rush, which we presumed was a way of herding cattle. We've since discovered more and it acted as a kind of level crossing over one of the garden's main routes, and down which cattle rushed to drink from the stream. We climbed higher through the garden to get this fantastic view of the maze which was planted in 1883 and continues to baffle visitors - including us! We did get to the middle but it was hard work, not helped by the fact that it's set on the side of the valley, so it was all up and down, and round and round and then back again! It's beautiful to look at though. After our trip in the maze we happily spent some time admiring the ferns and orange flowers. And getting our breath back! So with a final look back at the valley - just look at that blue sky - a scoot past the Boat seat, it was time to claim our hard earned cream tea in the cafe. There is another entertaining feature called the Giant's stride, but I'll save that for next time. It's fun and definitely provided us with some laughs.